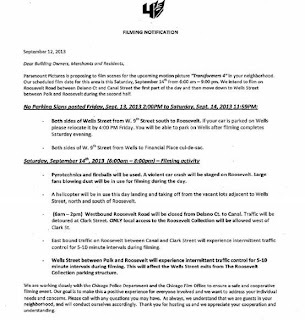 A new filming notice from Transformers: Age of Extinction indicates that production will be in the Wells Street to Roosevelt Road area on Friday and Saturday. As usual the notice gives no indication on what scenes will be filmed but it will have some Bayhem. According to the notice, "pyrotechnics and fireballs will be used. A violent car crash will be staged on Roosevelt." A helicopter will also be filming the scenes with its landing area in a nearby vacant lot.